Article write-up by Merle Summers. 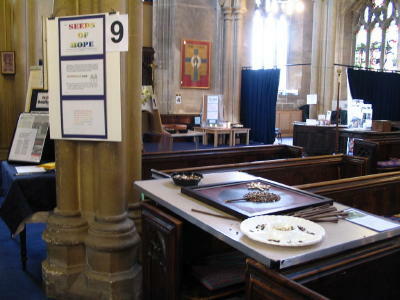 Event organised by the Local Ecumenical Partnership of churches. Earth Connect created & photos by Janet Lunt. 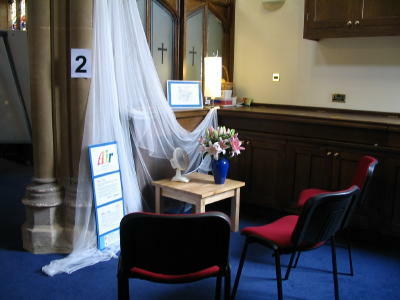 We were promised a thought-provoking and moving experience and we were not disappointed. 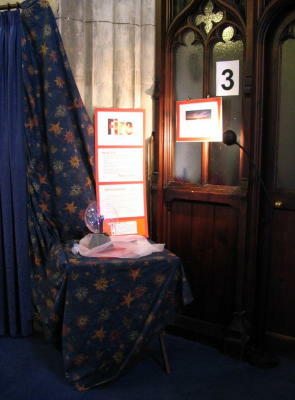 Janet Lunt, in conjunction with Agora, a charity dedicated to helping people reflect constructively on difficult issues, produced a series of tableaux which stretched the mind and stirred the conscience, and few of us who spent time in St. Peter's Church during the three days of the event were left unmoved and unmarked by it. Starting with imaginative interpretations of Earth, Fire and Water, the visitor was immediately plunged into an appreciation of the inter-connectiveness of the natural world and of the delicacy of the balance of nature. 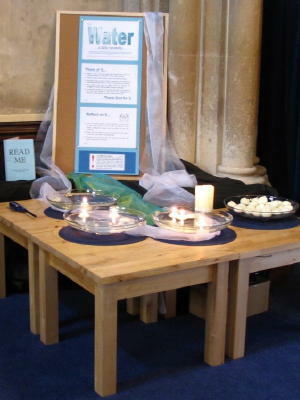 At the water tableau one was invited to light a candle and to reflect on the problems humankind is creating as the candle floated on the water. To emphasise the fragility of the balance of the natural world visitors were next invited to remove a brick from a tall tower. 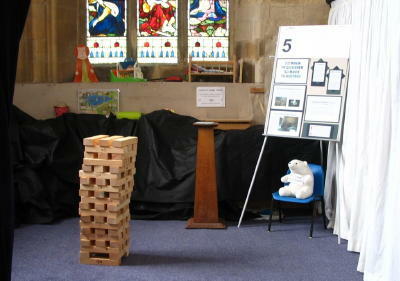 The tower remained stable for a while but inevitably it fell under the strain; a lesson here for all those who chose to see it! 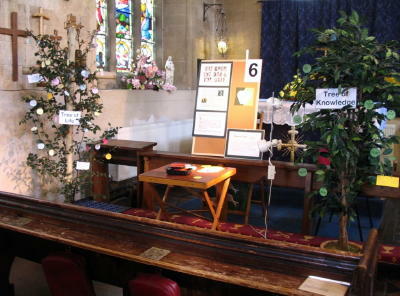 Two trees stood in front of the Lady Altar. One, the Tree of Life, labelled with the names of all the good things with which the world has been endowed by God; the other, the Tree of Knowledge, bearing the fruits of our deviation from the path chosen for us by God, and we were invited to add to the list of humankind's failures. 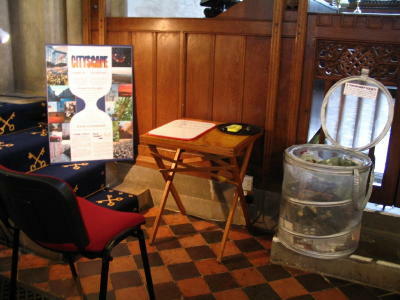 A bin of rubbish at the foot of the chancel steps provoked us into thinking about the wastefulness of our world and we were invited to place pieces from the bin into receptacles whose shape made up a Cross as we reflected on the world's need for changing attitudes and for action. At the end of this Prayer Trail, for that is what it was, we were invited to pray for the future of God’s creation and for our world and for our part in it. The power of "Earth Connect" lay not only in its visual impact but in its appeal to all the senses - the fragrant scent of lilies in the very first tableau and the beautiful and so appropriate music which was playing in the background. 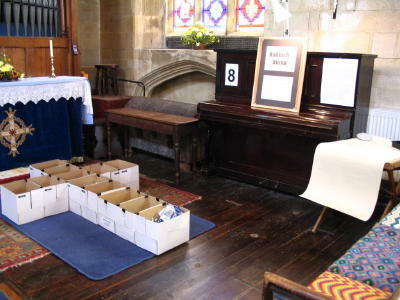 We were pleased to welcome children and their teachers from our local Primary School. They asked some very pertinent questions and made some excellent comments. It is, after all, their world that we are concerned about. 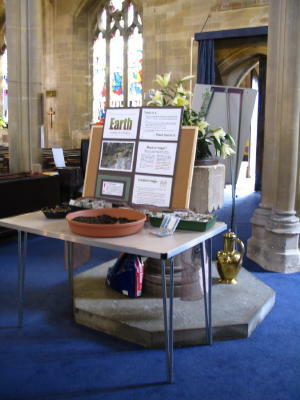 Our thanks to Janet who is the inspiration behind "Earth Connect", which she sees as a new and innovative way of presenting the Christian faith. Those of us who were privileged to experience it feel that it is a presentation deserving of a much wider audience than it has had so far. If you get the chance to see it, especially if you missed it this time, do go out of your way to visit it. You will not regret it and you will not forget the lessons that it teaches. If you have other stories to add, please contact the Webmaster.